When I first started reading this book, I was awed at the unique writing style Rick had. It was perfect for this apocalyptic, alien-invasion themed novel. Every time I picked up this book and put it back down, I had a sick feeling in my stomach and was scared out of my mind at the fact that we – meaning all us humans – were going to die. The desperation that’s viewed through the three character’s POV is realistic and clear, and some of that desperation stayed with me several minutes after closing the book. That brings me to another point: the three-character POV. Though it was interesting reading this book through three different POV’s, sometimes it was confusing at the beginning about whose POV I was reading, especially when the POV first changed, since I didn’t know that I was going to read from anyone but Cassie’s perspective. After a while though, I came to crave those changes in narration, especially because at least two of those characters weren’t in the same place, and it was nice knowing what was going on in the two different places this story mainly takes place in. Also, as a bonus, whenever one POV seemed to get boring, the reader would soon be reading another. The different POV’s also helped me get to know each character better, and by the end, I knew who I liked, who I loved, and who, at times, annoyed the heck out of me. 2013 is filled with dystopias complete with the perfect romance, but while reading this novel, it was clear that this was something different. For one, the main character isn’t a rebellious teen, but a broken teen girl who trusts nobody, has a crush on a guy who has never noticed her and may or may not be dead, and carries around a teddy bear everywhere she goes. And oh yeah, her parents are dead, she’s not sure where her little brother Sammy is, and she might just be the last human left on Earth. So yeah, this definitely wasn’t unoriginal. Also, romance wasn’t the main theme in this book; it didn’t even take up half this book, really. Most of The 5th Wave is focused on dark thoughts, action, and death scenes. Still, the romance was enough to satisfy me, so I’m willing to bet almost any YA fan would enjoy – or at least, not hate – this book. I was surprised after reading when I realized how many times I changed who I wanted Cassie to end up with. When Cassie first mentioned her long-time crush from high school who she only spoke to once, Ben, I was vehemently wishing he would end up with her. Even when Evan came along, he seemed too nice, and I was still voting for Ben. Then, unexpectedly, I came along Ben’s POV, and when I realized that he had no idea who Cassie was, I was all Team Evan. At least he cared. I switched back and forth between these two guys several times, often making excuses for Ben like “maybe he’ll be struck by her beauty and courage when they meet again.” Needless to say, by the end of the novel, I was all Team Evan. Unfortunately, I’m not 100% sure what Cassie was thinking by the end. After reading some people’s comments on the book, I saw that the character Ringer was one many people, especially girls, liked, their reason being that she’s strong, sassy, and a total inspiration for girls. Of course, I might have noticed that too, except the obnoxious part of me only saw her as Ben’s future boyfriend, which completely ruined my plans of there being a love triangle between Cassie, Ben, and Evan. I know that this book isn’t based on romance, but you can’t blame a girl for trying. I wasn’t a huge fan of the ending, as I believed it was much too abrupt and peaceful, especially considering that someone very dear to my heart (sort of) may or may not have been dead by that point. I mean, by the end of the novel, two characters are literally hugging themselves under the sunset, while their life is obviously still in danger, and someone’s life may already be gone. That behavior just isn’t appropriate in the least. I’d recommend this book to all YA fans, but especially all hard-core dystopia/apocalypse addicts. This book will satisfy both romance and non-romance lovers, though mostly the latter considering the large amount of science-fiction and “everyone around me is dying” trauma. The cliffhanger at the end, the unique plot, the interesting character build-up, and the writing style are what are going to have me waiting for the next book in the series. I can’t wait to see what Rick will come up next! ← Sorry Guys, But It’s Uploading Time! Love this review! 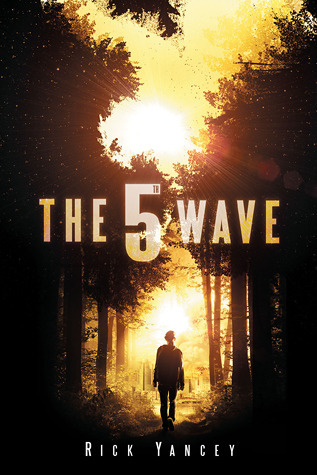 I finished reading The 5th Wave a few months ago and it was superb. Glad somebody else liked it as well! Thanks, I’m glad you liked it (both the book and the review lol)!